Japanese Prime Minister Shinzo Abe said a North Korean ballistic missile has passed over Japan, per CNBC, noting it's an "unprecedented, serious and grave threat." It landed in the ocean, according to Japan's chief Cabinet secretary and broke into three pieces, per Japanese broadcaster NHK. Yonhap News Agency reports it flew about 2700 km, which would indicate it was a medium-range missile. South Korea's presidential office is convening a National Security Council meeting, per Yonhap News Agency. The Japanese government warned citizens in northern Japan to take cover in solid buildings or underground shelters, per CNBC. A new step: This appears to be the first time North Korea's launched a ballistic missile over Japan, and marks an aggressive escalation; normally tests are shot upwards or "lofted." North Korea has previously launched rockets over Japan, which it has claimed it was doing to put satellites, not weapons, in space, per BBC. The key difference here is rockets are unguided whereas missiles have a guidance system to steer towards a target. Why it matters: Josh Pollack, Editor of The Nonproliferation Review, told Axios, "this is a big first. They warned they might do this back in early June and then again a few weeks ago in connection with Guam. But the Japanese are bound to be angered and dismayed. Not that there's much they can do." Be smart: Richard Haass, president of the Council on Foreign Relations tweeted, "N Korea missile test over Japan will stimulate missile defense buildup as well as intensify consideration of preventive military action"
Japan did not attempt to shoot down the missile according to NHA, a Japanese broadcaster. Col. Rob Manning, director of press operations at the Department of Defense, said this did not pose a threat to North America, ABC News reports. 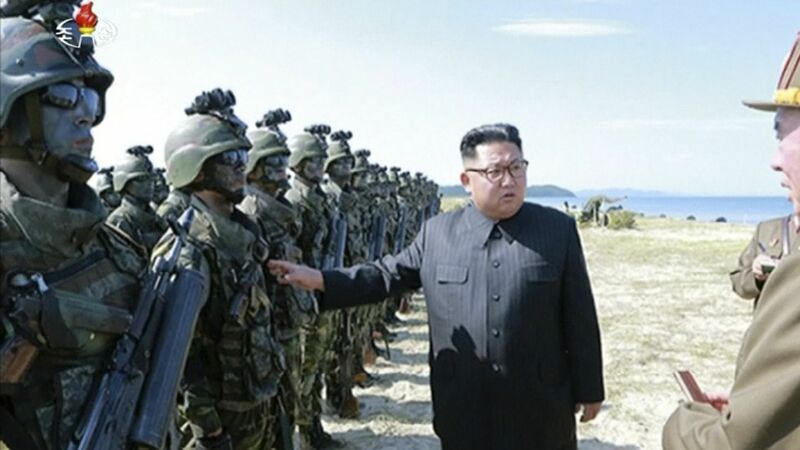 This comes amid U.S. and South Korean joint military exercises, which North Korea perceives as rehearsal for invasion. August 28 was the final day of exercises for thousands of Japanese and U.S. troops in northern Japan. North Korea also launched three projectiles this weekend, which U.S. Pacific Command assessed to not be a threat to the U.S.The post has been updated to reflect that North Korea has reportedly previously employed satellite launch vehicles that sent rockets over Japan.